Here is a comparison of the different electric bike motor systems to help you determine which configuration is best for your riding needs. 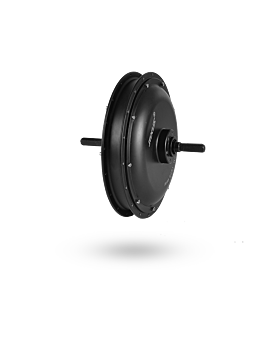 Mid-drive systems are known for higher performance and torque when compared to a similarly powered traditional hub motor. They can leverage the lower gears of the bike and keep their rpm’s in an efficient range without getting “bogged down” like a hub motor. This is a good feature if you ride in areas that have consistently long and steep climbs. These motors can also leverage the higher gears of the drivetrain to cruise along at high speeds on the flat or inclined roads. Since the motor is at the cranks of the bike it provides for a low and centered weight distribution. This helps improve the overall handling of your electric bike by better distributing the weight. Most mid drive systems use a chain, cogs, and derailleur drivetrain. Some systems are compatible with internally geared hubs and belt drives. There is the ability for a mid-drive system to use a throttle and/or cadence or torque sensor pedal assist. Some mid drives are pretty sophisticated with sensors that measure the pedal power, wheels speed, and crank speed to provide assistance that blends with the riders power to create a very intuitive ride feel. There are also sensors that will reduce power when the system senses that the rider is going to shift gears to make the shift smoother. In addition, there are some mid drives that are integrating with electronic shifting systems. Since the power is being transferred through the drivetrain of the bike there can be more wear applied to the drivetrain components (chain, cogs, derailleur, etc.). The higher power systems will add significantly more wear and those components may need to be replaced on a more frequent basis. To keep the mid drive motor operating efficiently you need to be shifting the gears properly for climbing hills or cruising along the flats. Some mid drive systems can sense when you are going to shift the gears and they will reduce the power for a smoother shift. There are some systems that don’t have these sensors and that can lead to abrupt shifts when the motor is applying full power. A majority of mid drives have a single chainring which limits the gear range to a rear cogset or to the gear range of an internally geared hub. Most of the popular mid drives systems are only available on complete e-bikes with specific frame mounts. There are not many retro-fit mid drive kits to choose from right now but it seems that there may be more on the horizon. 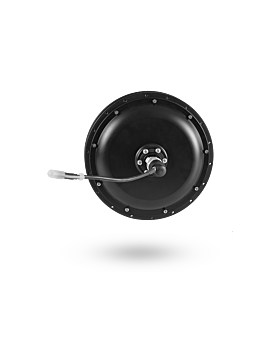 Hub motors are electric motors that are housed in the hub of either the front or rear wheel. 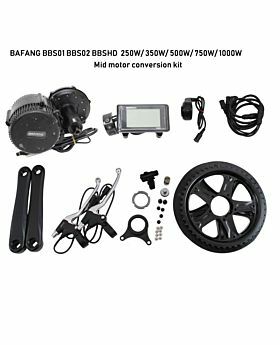 These are the most common motor that you will find on an electric bike. It creates an all-wheel-drive bike because the motor drives the front wheel and you can power the rear wheel with your pedal power. This can be advantageous for riding in snow or in the sand. Any type of bike drivetrain (gears) can be used: traditional gears with cogs, chain, and derailleurs or internally geared hubs (IGH) with a chain or belt drive. Front hub motor systems are easy to install or remove from the bike because there are no gear systems to deal with (chain, derailleur, etc.) when compared to a rear hub motor. Front hub motors can provide a more balanced bike weight distribution if the battery is mounted in the middle or back part of the bike. This helps when lifting the bike onto a car rack or carrying the bike upstairs. Some riders do not like the feeling of being “pulled” by the motor. Since there is much less weight over the front wheel there is a tendency for the wheel to spin when accelerating on roads that have a layer of loose material (dirt, sand, snow, etc.) or when climbing a steep hill. This is more noticeable on the powerful and torquey front hub motors. Front hub motors generally have a throttle and/or a cadence sensor pedal assist. It is rare to find a torque sensor based pedal assist system for a front hub motor. 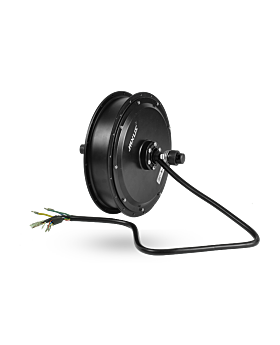 The front hub motors generally are focused on the lower power range (250 watts to 350 watts). There are higher powered front hub motors but they are not as common because the front fork of the bike does not provide as much of structural platform when compared the frame of the bike (rear hub motors). Front hub motors generally need a sturdy fork, especially for the higher powered motors. This is very important if you are installing a front hub motor kit on a conventional bike. They have a tendency to “bog down” on long steep climbs. The higher torque hub motors (generally the more powerful) need larger spokes and sturdy rims. Most people are familiar with the rear wheel driving the bike forward because that is the way 99.99% of bikes are built. There is significantly less tendency for the rear wheel to spin on loose road conditions because the majority of the rider’s weight is over the rear wheel. There is a wide range of power options (250 watts to 750 watts and beyond) because the bike’s frame provides a good structural platform to handle the high torque from the motor. 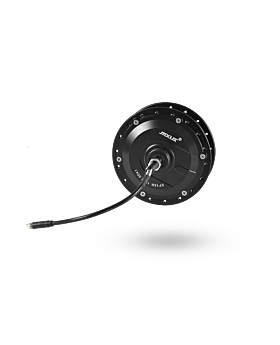 Rear hub motors can provide assistance with a throttle and/or cadence or torque sensor pedal assist. Rear hub motors are a little more cumbersome to install or remove because the gears (chain, derailleur, etc.) need to be worked around. Bikes that have a rear hub motor with a rear rack battery are back heavy and that can affect the handling of the bike. Some riders may not notice this if they are riding in a more cautious manner vs. a performance riding style. Back heavy e-bikes can be hard to handle while lifting onto a car rack or carrying the bike upstairs. How to choose an electric power wheelchair for adult mobility? How to load a Sur-ron light bee electric dirt bike inside a SUV?